This is Desirée who came to live with me 18 years ago. She is a Green-Naped Rainbow Lorikeet, Trichoglossus haematodus, a species of Australasian parrot no bigger than a crow. Eighteen years is a long time for this particular kind of parrot to live. 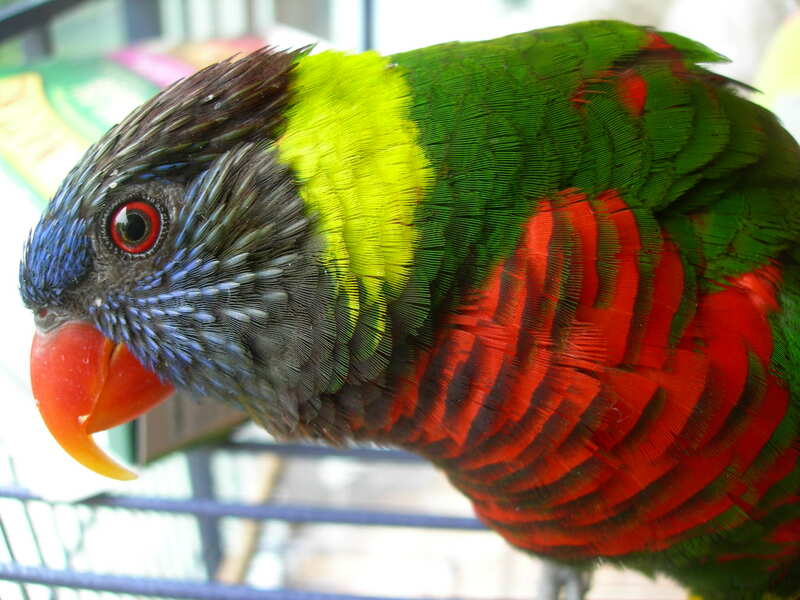 The larger a parrot, and therefore its brain, the longer her life span. Desi’s is about twenty years. I have been fortunate to live with four birds of this species, all of them rescues, since 1986. I’ve written two chapbooks of Desirée poems, still enchanted by her, amazed at her accomplishments, particularities, biology and personality. (Can a bird have a ‘person’ ality, I wonder.) She does. She’s funny, gorgeous, affectionate and at times, destructive with that sharp beak. She also uses it to brush up against my cheek and to kiss me on the lips each morning. The next poem follows Desirée the time she escaped from my screened porch north of Sharbot Lake. It was August. She was two years old, and had never really experienced the outdoors. In the next twenty-four hours she, who had never flown farther than from cage to table, flew over 40 kilometres across the sparsely inhabited Canadian Shield, coming to rest at a resort in Westport, sliding into the punchbowl at a Teacher’s Alumni Barbecue. She is a fruit eater and nectar sipper in the wild environment of her origins, depending on sugar for nourishment, so, as she would not have eaten or had anything nourishing to drink for 24 hours, she’d headed for what looked like juice. This poem tracks her through the biology of her eyes, how each part of them functioned as she flew across tree, rock and lake, to land at the resort..
large bowl of what looks like juice! I’d put an ad in our local paper, distributed in the Sharbot Lake area. The cook, though he wanted to keep her, realized someone who cared for her had lost her, and put his ‘found’ ad in the local Westport paper. The two distribution areas overlapped so there were about eight households who received both papers, put two and two together, and several people phoned me. Desirée and I were reunited in the resort kitchen, where they’d been trying to feed her with seeds. She, however, is a sugar bird, needing sweets and carbs, so after four days, she dived into the french fries on the table, and then into a butterscotch cream pie before she fell asleep on my shoulder, her beak all sticky with potato and pie mush. And if you’ve been heroic enough to follow this post all this way, my congratulations. 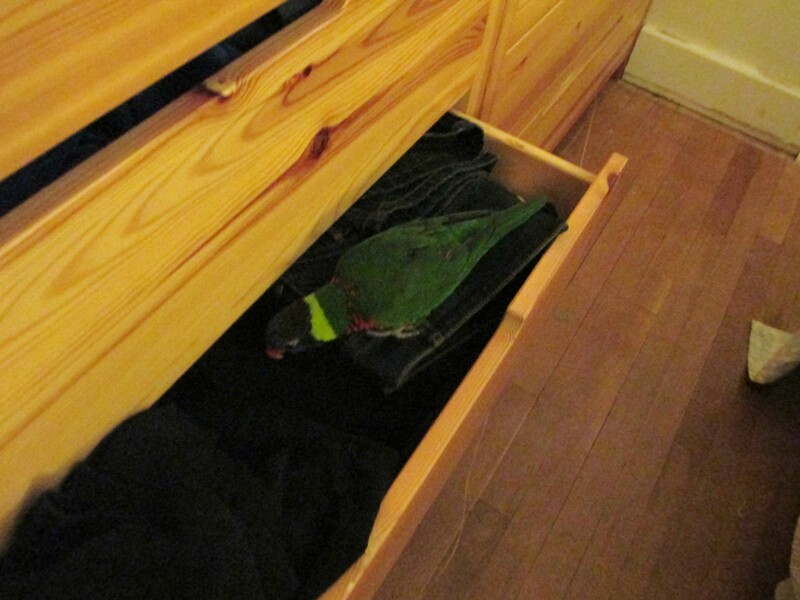 At the moment Desirée is asleep in her favourite place, in one of my dresser drawers, on a towel.